This self-check allows you a pre"
This test measures the bioavailable component of total cortisol through a saliva sample. Cortisol is known as the stress hormone. When we are confronted with a threat, cortisol targets the central nervous system, the metabolic system, the immune system and the cardiovascular system, with the aim of releasing energy to allow us to deal with the stressor and not waste precious resources elsewhere. Obtain focused guiding and deeper understanding of your body through in-depth analysis of several stress biomarkers. 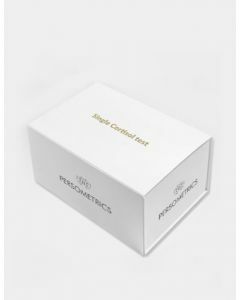 The Persometrics Extended Stress Hormone Profile gives you a fully personalised extensive stress hormone profile based on in-depth hormone analysis including cortisol and alpha-amylase. The report contains early predictors of burnout and other stress-related illnesses, in addition to circadian secretion showing your daily pattern of the activation of the HPA-axis. Includes full interpretation of your data and personalised life-style advice. The Persometrics Extended stress hormone profile adds to the original Stress Hormone Profile. This profile is based on analysis of two different hormones on five samples of saliva that you yourself will obtain in your home or at a place of your choosing (5 saliva samplings; 10 laboratory analyses). You will receive your results on all samples as well as scientifically validated indexes (the Awakening Response and Circadian Profile, slope and total secretion for cortisol and Alpha-Amylase, as well as Cortisol over Alpha Amylase ratios), interpreted in relation to normative data, and a full report which tells you if you are at risk of stress-related illnesses such as burnout and early aging. This report can also show abnormally high cortisol values during the day. The report further includes personalised life-style advice to let you take actions to avoid such illnesses, such as what time of day is recommended for people with your adrenal profile to do exercise and what dietary modifications to perform, if any. Beware that any such changes must be discussed with a health care practitioner before undertaken. We recommend retaking this test after six months of undertaking any therapy you may be following (such as lifestyle changes or wellness treatment) to check for any beneficial effect on hormonal imbalance or day-time cortisol secretion levels. Feeling stressed or fatigued? Find your path to improved mental and physical well-being through adrenal stress biomarker testing. The Persometrics Stress Hormone Profile gives you a full personalised report based on both behavioural and biomarker analysis. The assessment of the stress hormone cortisol in conjunction with your questionnaire data gives early predictors of burnout and other stress-related illnesses. The profile includes full interpretation of your data and personalised life-style information. Persometrics Stress Hormone Profile is based on samples of saliva that you obtain in your own home (five saliva samples; five laboratory analyses in total). You will receive your easy-to-understand results showing your total secretion, your diurnal/circadian cortisol pattern, as well as two scientifically validated indexes: the so-called Cortisol Awakening Response (CAR) and the Cortisol Slope. This will all come in a complete report which tells you if you are at risk of stress-related illnesses such as burnout. The report further includes personalised life-style choices and actions likely to be effective for people with your profile according to the latest scientific research. Consider retaking this test every four to six months to check progress of any therapy you may be following (such as lifestyle changes or wellness treatment). For optimal results, the Persometrics Stress Hormone Profile is based on both biomarker and behavioural data: in addition to the hormone sampling, you will complete questionnaires through a secure, online platform. The questionnaires can be completed in English, Spanish, French, Norwegian or German. This can be chosen during the completion process. However, please note that the report is currently only offered in English. Persometrics Ltd. is listed on the Commercial Register of Vaud, Switzerland (CHE.348.746.950). Registered office: Chemin de la Rosière 58, 1012 Lausanne.